Ask anyone you like to name an Old Testament Bible film and they will always give you the same reply. Cecil B. DeMille's The Ten Commandments starring Charlton Heston. DeMille's film (until recently) towered above all other Bible films at the box office, and in the public consciousness, and still dictates the way the story of Moses is read and imagined two generations later. It is in fact 50 years since the release of that film, and as a result someone has decided that it was high time someone re-visited the subject matter. Of course Moses hasn't been absent from our screens these last five decades. Straub and Hulliet's unusual adaptation of Schoenberg's Moses und Aron broke the deadlock in 1973, and was swiftly followed by Moses (1975) starring Burt Lancaster. 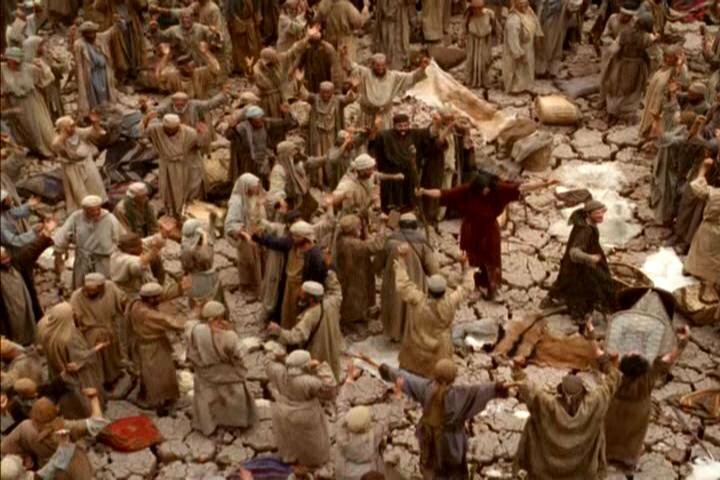 Wholly Moses (1980) attempted to do for Moses movies what Life of Brian did for Jesus films, and the end of the nineties brought two more interpretations. 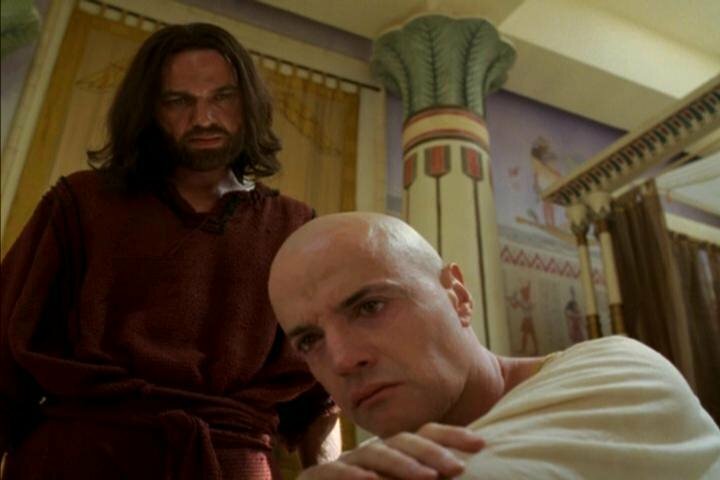 Roger Young's lesser known Moses (1996) featured an incredible performance from Ben Kingsley and was one of The Bible Collection's finest films. Finally, in 1998, Moses was again a popular cinema icon again as Dreamworks produced its animated Prince of Egypt. So whilst this is far from the first Moses film since Chuck Heston donned his huge white beard, it is the first film since then to dare to call itself The Ten Commandments and take on the multitude of connotations, evocations and comparisons that this title brings with it. And about time too. Early on this film nails it's colours to the mast. This is going to be a very different version of the life of Moses. Whereas DeMille's film spent two hours getting to the point where the one time prince is banished from the land in which he grew up, this film gets to that point (just one and a half chapters into the book of Exodus) in 20 minutes. However, even in this short time it has already managed to build in a convincing relationship between Moses and his (fictitious) step brother Menerith. The story slows down a bit once Moses reaches Midian, rescues Jethro's daughters and marries his eldest. The change of pace highlights a key theme that will emerge in this film. Here we see him adjust from city life to being a nomad in the desert. Later he will lead his people through a similar transition. Soon enough though Moses encounters God at the burning bush, and reluctantly agrees to do God's bidding for him in the court of the new pharaoh. Aaron and the Israelite leaders take some convincing; Pharaoh, obviously, needs even more and Egypt is engulfed by the ten plagues (although only seven are present). The plagues have always interested historians and scientists alike, and numerous theories have developed giving natural explanations for them. Here, as with DeMille's film, such theories are toyed with. DeMille put them on the lips of the sceptical Ramsees. Here we hear some from the narrator (which brings with it a sense that his is unquestionable and objective), but others are shown and discredited before our eyes. It is an interesting mix, and leaves the viewer some scope to consider their own response. The final plague, the death of the first born, has traditionally been given short shrift by Moses films. In DeMille's first version of The Ten Commandments (1923), Pharaoh's child is such a brat that the viewer can't wait for him to be killed off. Recent version have been more sympathetic, the Prince of Egypt stands out in particular, but this film moves things one a stage further. Not only are we shown an Egyptian (Menerith) who we can sympathise with who loses his beloved son, but there is a strong visual similarity between Ramsees' son and the early scenes of Moses as a boy. Menerith calls Moses' god a cruel god, and Moses is unable to argue with him. 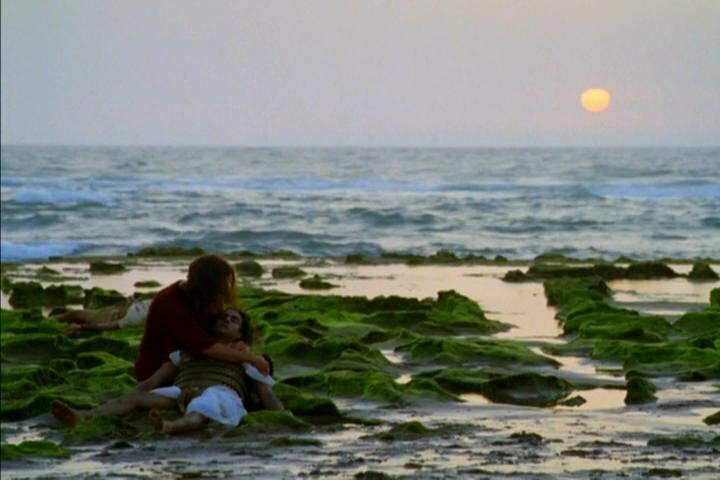 As this film comes in two parts, it breaks just as the Israelites are crossing the sea, leaving most of the film for more unexplored territory. As a result we see episodes that are rare for films about Moses; the bitter waters of Marah, the provision of manna and quail to eat, water from the rock, the victory of over the Amalekites and the visit of Jethro. This scene is perhaps the most curious. The way the bible tells this scene, Jethro brings Zipporah and Moses's sons back to him, and then advises him to delegate out his work load. Here, agonisingly almost, Jethro's arrival contains no such marital advice, even though it means the breakdown of Moses's marriage. Instead he advises him to take the opposite course of action and "trust no-one". It's a strange variation on the story, and whilst Jethro is later proved right to a degree, such pre-figuring is unnecessary. Omar Sharif's wisdom would have been better dispensed along traditional lines. It is this second half of the film that one gets the impression that the film makers really care about. Whilst the first half of the film is tightly wound so that it fits in as much as possible, the second half of the film is allowed to roam around new territory much like its subjects. New sub-plots are imported to give more of a sense of the challenges Moses faced in working this group of former slaves into a new nation. Some of these are more successful than others. When two of the Israelites commit adultery, and then try to cover it up with murder and perjury, the need for some sort of moral framework is nicely highlighted. On the other hand, the scenes of the Israelites developing an army to take on the Amalekites feel a little too reminiscient of Spartacus and Gladiator. However, it is this emphasis on the need for Israel to transition from a group of slaves to a nation, which distinguishes this film from the other Moses movies. Most tend to focus on Moses initial successes, even though he actually led the Israelites for more than a generation, his accomplishments were far more than being the man who held a stick over the sea whilst God peeled back its waters. On of the other things that this film considers is the development of monotheism. The realisation gradually begins to dawn on Moses that there is only one god, and that he is God of the whole world. There are many facets of this development; Moses first hearing about the Israelite God, encountering him at the burning bush, and his subsequent meditation on his name. Later on Moses notes that God is travelling with them outside of Egypt and his recollection of the story of monotheistic pharaoh Akhnaten brings things to a head. What is strange is the way that the film emphasises this aspect whilst also purging the story of its Jewish roots. Perhaps the biggest strength of this film, however, is the way it handles the difficult parts of the bible, and stares unflinchingly form the parts that today seem unpalatable. The most striking aspect of this is the character of Moses himself, who is deliberately played unsympathetically at times. 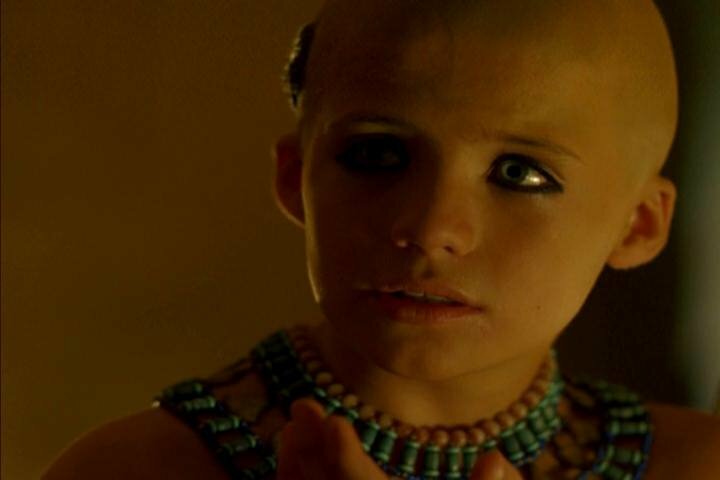 When he is told as a child that he needs to master his temper, we expect this only to apply as far as his murder of the Egyptian, and are surprised when it continues unchecked. After his violent rescue of Zipporah and her sisters, he recognises that he has acted out of anger and how foolish that was. His confrontations with his fellow Israelites are frequently angry, and he holds some resentment towards the God he serves yet struggles to understand, throughout the film. Dougray Scott's portrayal is a far cry from Charlton Heston's noble prince turned sinless prophet. Yet there is, perhaps more biblical warrant for this occasionally petulant version of Moses than Heston's. When Heston tries to shrug off God's call, it seems more like modesty than anything else - the biblical Moses takes far more convincing, and is still arguing the toss three chapters later (Ex 6:12). 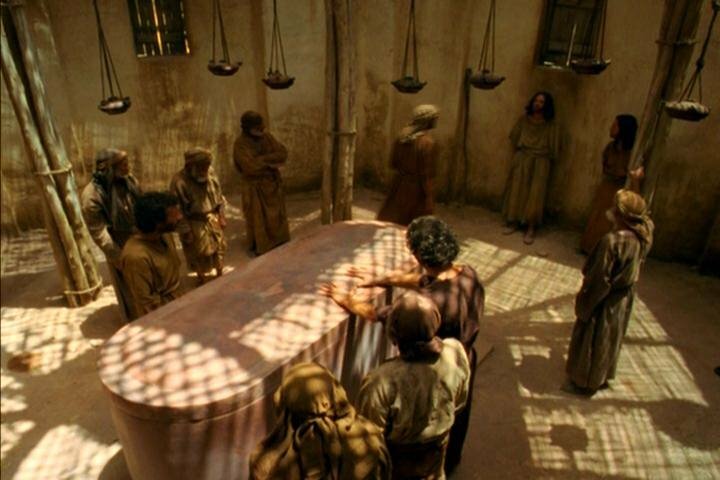 Every time the people moan to him, he moans to God, even asking to die at one point (Num 11:10-15). The biblical Moses's anger continues throughout the story, causing him to smash the tablets of stone, and ultimately exclude himself from the promised land. 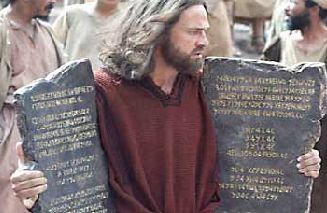 But the film is also unwilling to downplay the uncomfortable nature of other biblical episodes. After Moses returns from the top of Sinai it is he and his followers that kill everyone who continues worshipping the Golden Calf, rather than an act of God. Such parts of the bible should make us feel uncomfortable, and challenge our understanding of the bible. It is when bible films do this that they really prove their worth. The film does have it's weaknesses. Dougray Scott's wig is far more distracting than any piece of costume deserves to be. Some of the actors chosen for the lesser parts (such as David Schneider and Richard O'Brien for British viewers) are so fixed by their previous roles as to make it hard to take them seriously. And a scene where Moses tries to cajole Joshua out of his apparently naive pacifism should have been left on the cutting room floor. But, overall for a TV film it does so much right as well. There is plenty of interesting camerawork. When a defeated Ramsees finally agrees to release the Israelites, the low angled camera makes Moses appear to tower over him (right). There are a number of God shots, allowing the viewer to see things from his point of view from time to time. Best of all it handles the biblical text in a way that manages to be both faithful enough to appease those seeking a very literal adaptation, whilst also presenting it in a way that is fresh and challenging. The Ten Commandmentsis showing on ABC on the 10th and 11th of April. Cast: Dougray Scott (Moses), Omar Sharif (Jethro), Linus Roache (Aaron), Mía Maestro (Zipporah), Susan Lynch (Miriam), Karim Salah (Joshua), Naveen Andrews (Menerith), Padma Lakshmi (Princess Bithia), Paul Rhys (Ramses). ABC must have paid you well.. Yawn. Seriously though, I'm sorry you didn't like it. It's not unusual that I think a film's strengths outweigh it's weakness and someone watches it and disagrees. Even the greatest films of all time have their detractors and often films that are panned by the critics do well at the box office, whilst films critics praise struggle to make a profit. IMDB gives it 4.2, so I guess the majority of people would side with you. Fair enough, it worked for me, but I'm certainly not surprised that others disliked it.